Haft Tappeh workers on the sixth day of their strike, February 5th 2018. On the seventh day of their protest the workers of Haft Tappeh have closed the sugar warehouse, and to prevent any sugar from being taken out, have emptied the lorry. According to a report, the Haft Tappeh workers are still on strike to achieve their demands. Today, Tuesday [February 6th], the Haft Tappeh workers again gathered in the factory area and went on strike. The workers are determined not to give up until they achieve their demands. We, the members of the Haft Tappeh Sugar Cane Workers’ Union, say “more power to your elbow” to the workers and that we strongly believe that victory will belong to us workers. United and organised workers will never be defeated. Long live the workers’ class unity and solidarity. 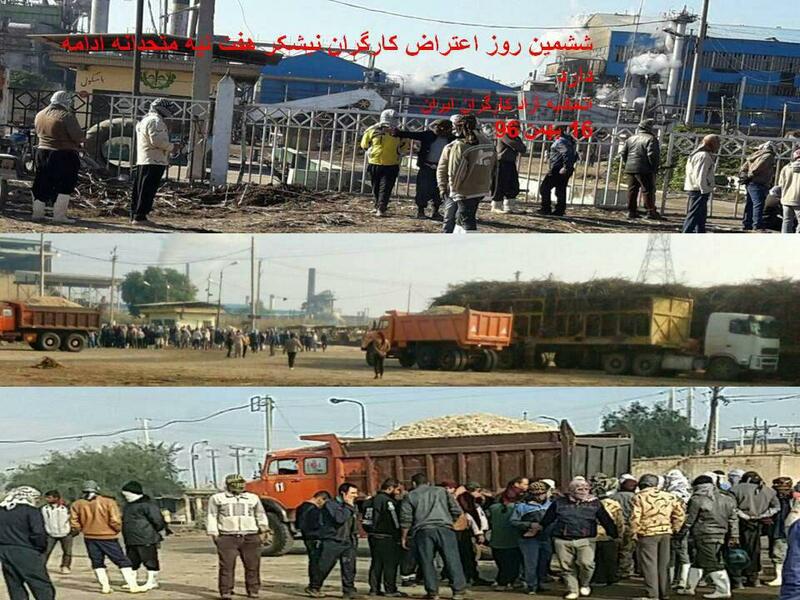 Source: Haft Tappeh Sugar Cane Workers’ Union, 6 February 2018.